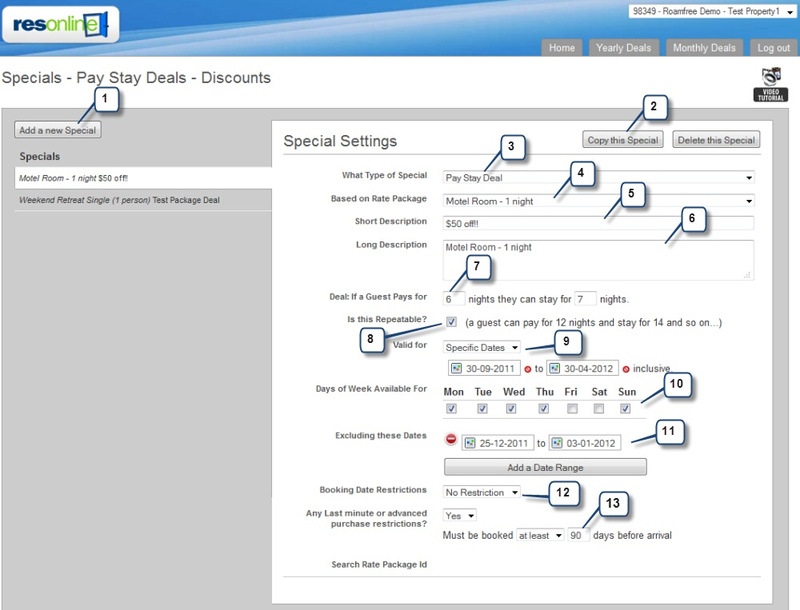 From the Home menu, click "Specials"
The specials interface allows you to create specials using your existing rates. You can be as creative as you wish with options to include or exclude dates the special is valid for along with setting the bookable dates. Any specials you create here will be available on you own Website if you are using the booking button as well as compatible distribution channels such as Bookeasy, TXA and roamfree if you have set these channels to "active" under Distribution. 1. Click "Add a new Special"
5. Enter a short description. This is appended to the rate plan name. 12. You can also add booking restrictions. An example would be to create a special valid for stay dates in the future, but it must be booked this month.